Taiwani handset maker, HTC has unveiled it’s latest dust proof and water proof smartphone, HTC Desire Eye with Dual-13-MP Camera on 8th Oct. 2014 . New Desire Eye is the cocktail of style, speed and technology slated to hit Indian market This Nov. 2014 in Blue, Red, White colour option expected price around Rs 50,000. It’s coming to Kill new Apple iPhone 6, iPhone 6 Plus and Samsung Galaxy S5. The all new HTC Desire Eye can survive into 1 meter deep water for 30 minute due to IPX7 certified Technology. It supports 4GLTE, NFC offers you bigger and brighter a 5.2 inches Full HD display with resolution (1080 x 1920 pixels) and 14M colour with HTC Sense 6 UI. New Desire Eye promising blazing multi-tasking with 2.3GHz quad-core Qualcomm Snapdragon 801 processor and Android 4.4.2 KitKat with Sense v6.0 UI. It also offers you 2GB RAM, 16GB internal memory with 128GB expandable memory which allows you store all your favourite Song, Video, Movies and Games sporting a 13-MP primary Camera with Dual-LED flash and 13-MP front facing camera with Dual-LED Flash and HTC Zoe. New Desire never let you down due to 2400 mAh battery promising talk time: up to 26.8 hours(3G) and standby time up to 504 hours on(3G) measures 151.7 x 73.8 x 8.5 mm and weight 154 g offers connectivity via microUSB, Bluetooth 4.0 with aptX enabled, Wi-Fi, DLNA, GPS/AGPS + GLONASS, NFC and 4G LTE including Front-facing stereo speakers powered by HTC Boomsound technology, HTC Blinkfeed, HTC Sense TV and Knock On gesture-control. HTC also unveiled new HTC One(M8 Eye) with Single SIM(GSM) and Nano SIM, NFC, 4G LTE comes with a 5-inch full HD screen display 1080×1920 pixels resolution for clear Cristal view . To revolutionize your multi-tasking it’s runs most advance on Android 4.4.2 KitKat with new HTC Sense 6 UI on top and HTC BlinkFeed™ powered by a faster 2.5GHz quad-core Qualcomm Snapdragon 801 processor. It also offers you 2 GB RAM comes with 16GB and 32GB model with 128GB GB expandable memory Via MicroSD sporting a Duo rear Camera with 4-UltraPixel, pixel size 2.0um, F2.0 / 28mm lens, HTC ImageChip2 with HDR video and 5-MP front camera with HTC Eye and HTC Zoe packed with 2600mAh battery measures 146.36 x 70.6 x 9.35 mm and weight 160gm including HTC Sense TV , HTC Zoe, HTC BoomSound speakers, Knock On gesture-control offers connectivity through microUSB, Bluetooth 4.0 with aptX enabled, Wi-Fi, DLNA, GPS/AGPS + GLONASS. 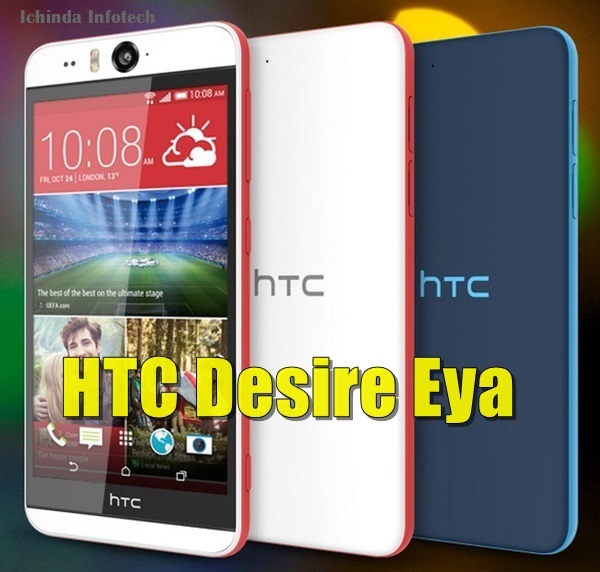 At last few Honest word, the all new HTC Desire Eye is coming make your life better than before. What you think? Please be open to give your view.